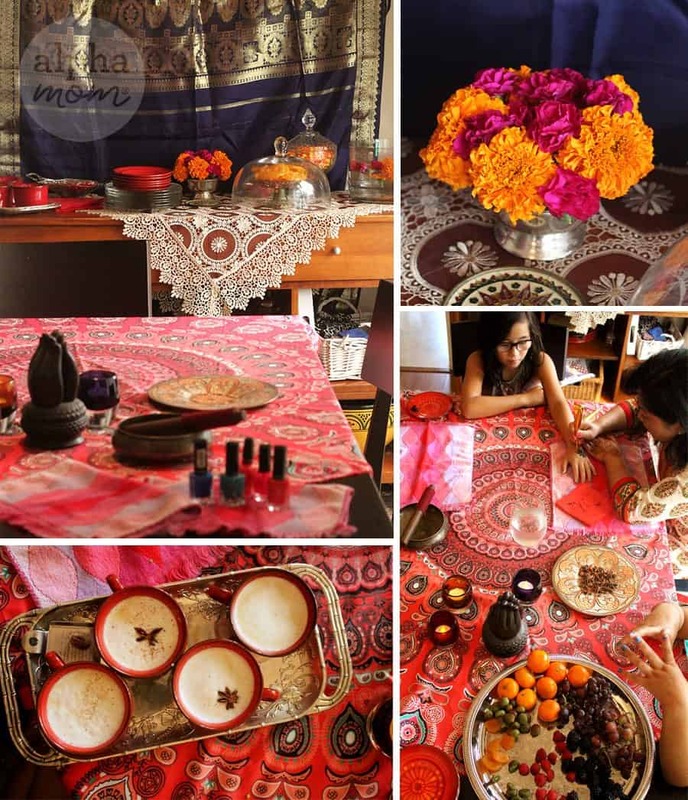 Host a Henna Party for Diwali! Do you know about Diwali? We have written about it before. Diwali is a religious holiday observed by people practicing Hinduism, Sikhism, Jainism that lasts five days and is often likened to the festival of lights and celebrated in India. 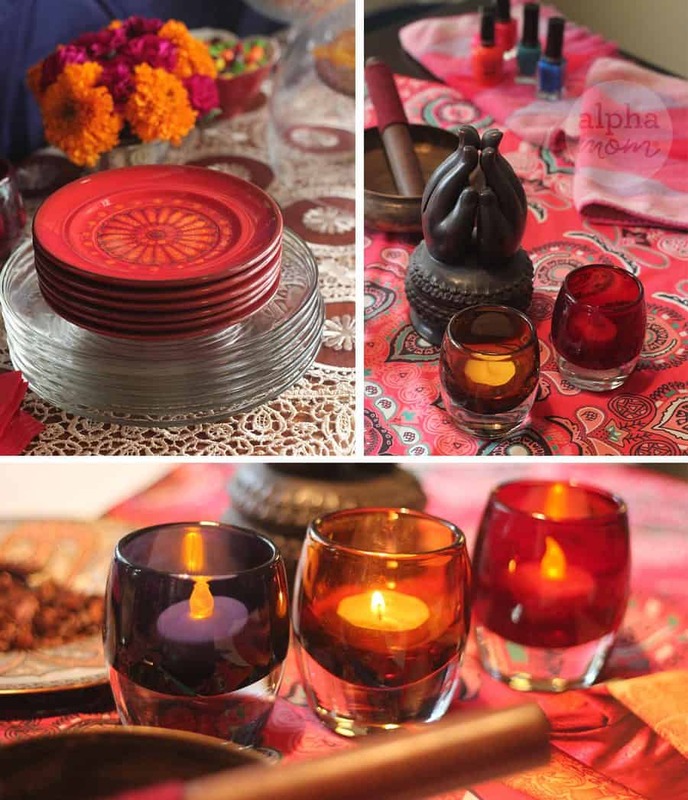 People light candles, dress colorfully and create beautiful mandalas with fresh flowers and spices. It’s a really fun holiday and very colorful, which is just my speed. As you know, at my house we use crafts and celebrations as a way to learn about other cultures. 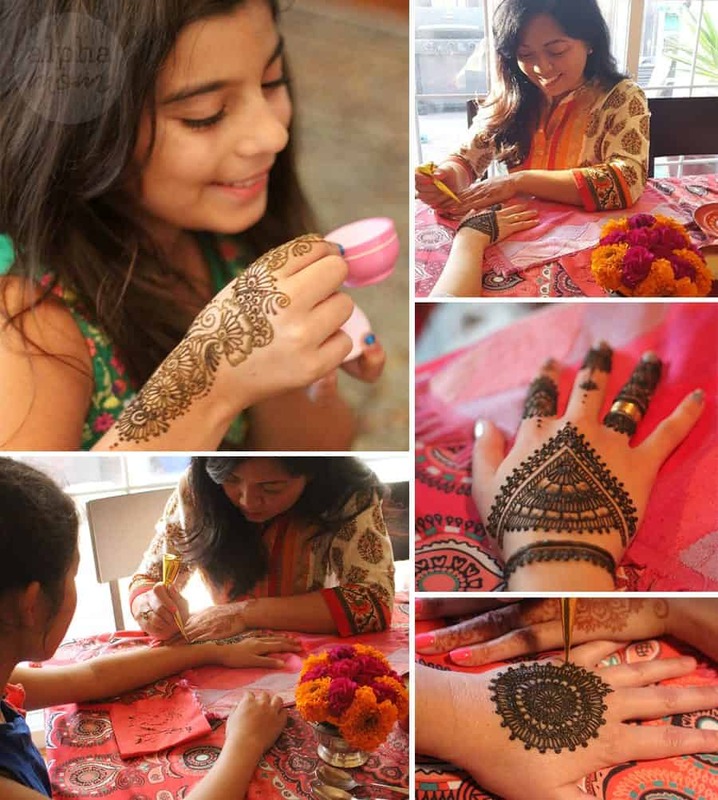 So, I decided we would host a Diwali-inspired Henna party for my tween daughters and their friends and let everyone get manicures and henna. It was so fun! First I decorated the house with bright fabric and lots of pretty votives. It’s very handy to have a spare sari around to hang on the wall or use as a tablecloth. But if you don’t have a sari any pretty table cloth will do. Then I hired a henna artist to come to our house. Someday I’d love to learn how to make and apply henna myself but for this party I left it to the experts. 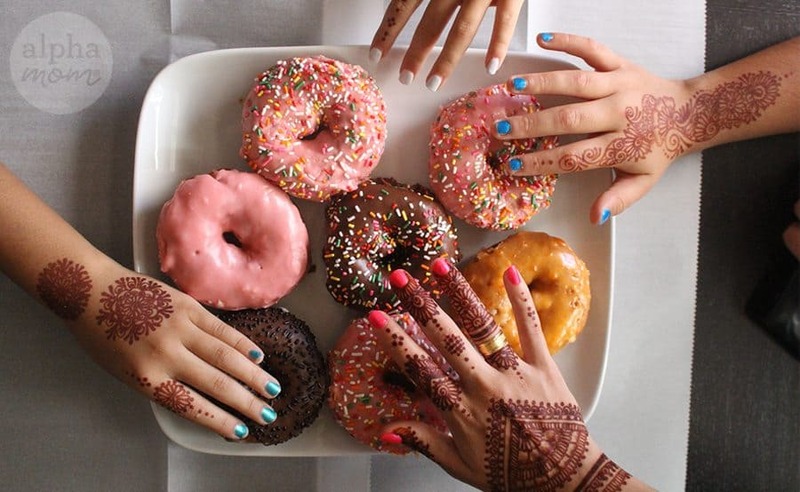 You can find a henna artist by Googling “henna artists” in your area. It’s often a good idea to check them out by attending an event they might be working at so you can see their style of art and talk about what you’d like, just like you would if you were hiring a tattoo artist but thankfully henna tattoos are temporary not permanent; they only last 1-7 weeks, so no huge commitment there. It’s important to be careful with what kind of henna your artist uses, though. Never use black henna which contains the chemical Para-Phenylenediamine (PPD), similar to black hair dye that may cause allergic reactions for some. Most henna is made from natural plant products (leaves from a henna tree, eucalyptus, lemon and essential oils) and healthy for your skin and shouldn’t cause any allergic reaction at all. You can read more about it here if you have questions. Before the henna artist arrived we made sure everyone had pretty fingernails and clean hands. It’s really important to do this early enough in the party so that all fingernails are dry before the henna artist gets there. 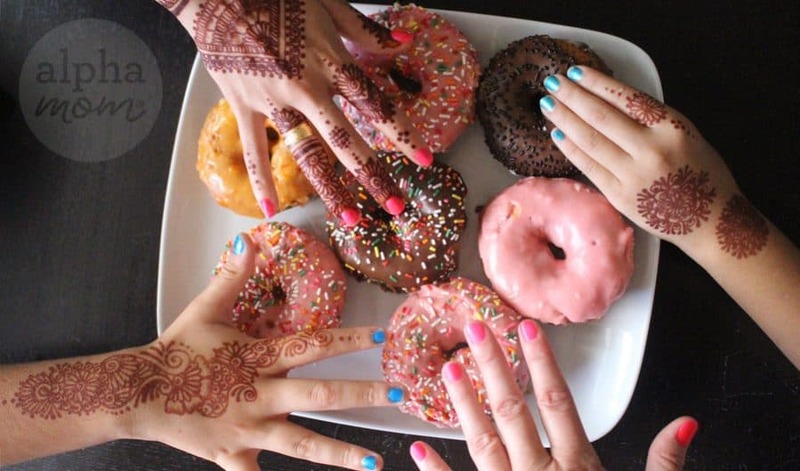 It’s hard enough to keep henna un-smudged without adding wet nails to the mix. Our henna artist (Henna by Evelyn) also happened to be a sound healer so she showed us some tricks with singing bowls which was really really cool. Then she got to work. It was a really good idea to have other activities for the girls to do while they waited for their turn for the henna application. As such, we made chai tea from scratch and of course had lots of snacks. Chai tea is really easy to make. Brew up some strong black tea (decaf for kids, of course). Add a few cinnamon sticks to the pot and star anise while it steeps. Then warm 2 cups of milk on the stove. Add 1/4 cup of brown sugar to the milk and stir. Don’t let the milk scald. When the sugar is dissolved and the milk is warm, froth it with an immersion blender or a whisk. 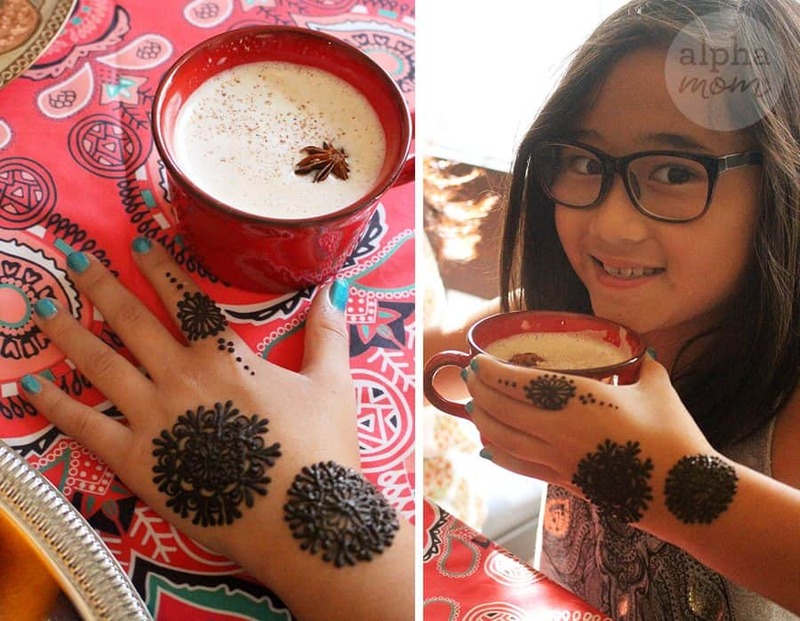 Fill a mug with half tea and then top with frothy milk, fresh nutmeg if you have it and a star anise for decoration! It’s really tasty. 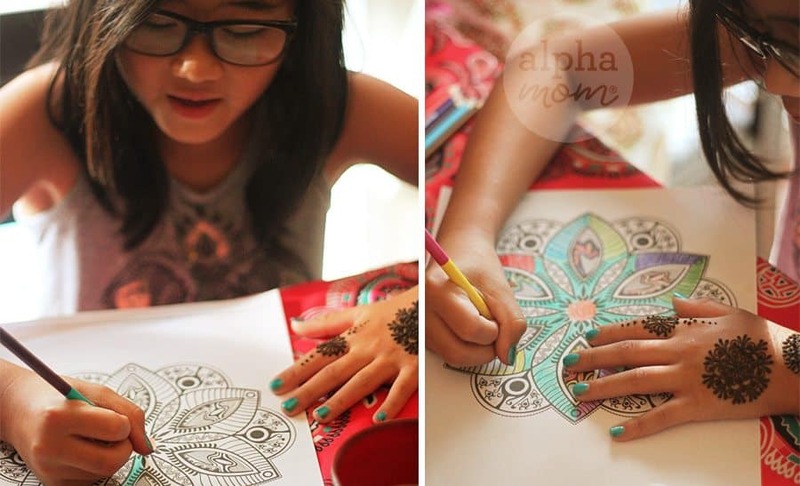 I also printed out some mandala coloring sheets for the girls, and had plenty of colored pencils handy. And of course snacks. 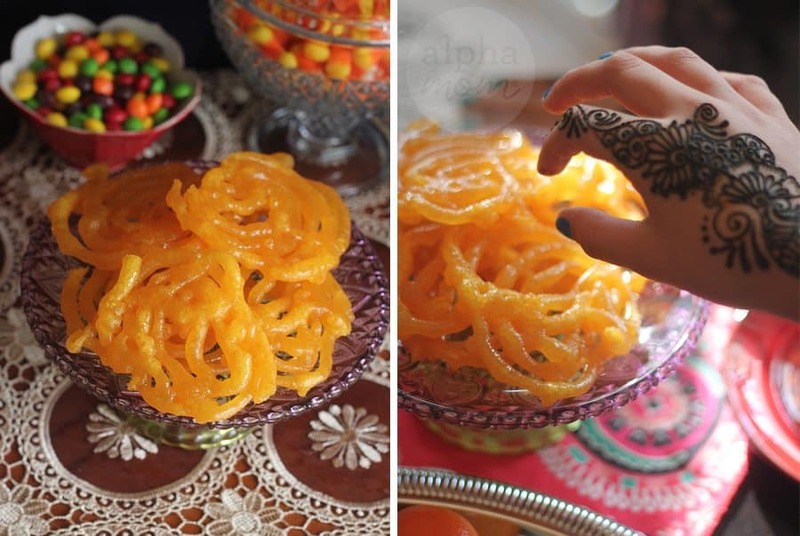 These bright orange-yellow cookies are called jalebi and they are so good! Very sweet. Getting henna applied is such a moving experience. So often we don’t allow ourselves human touch that is healthy like this. 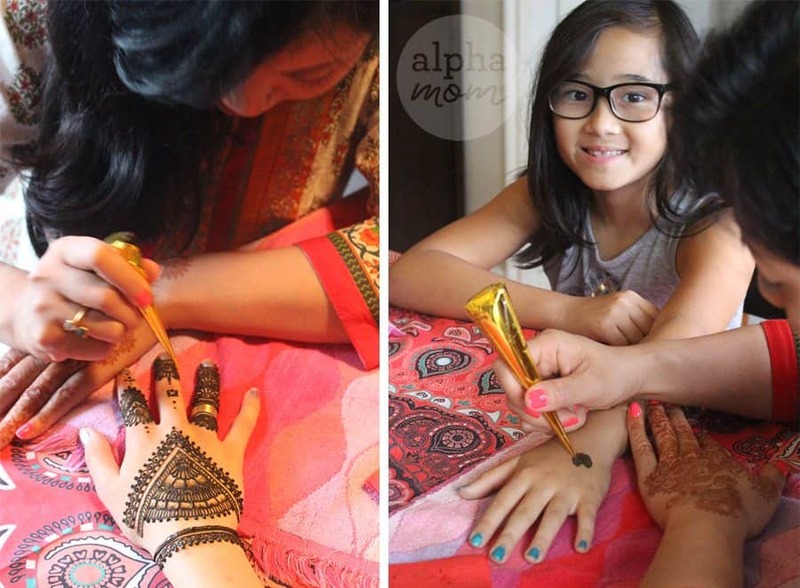 It was amazing how well the girls responded to the henna artist. She didn’t have any set designs but talked with them about their day and let her doodles flow, giving each girl her own unique design to match their personality. It was amazing. I learned later that one of the girls had had a really bad day so far and that the henna experience cheered her up immensely. 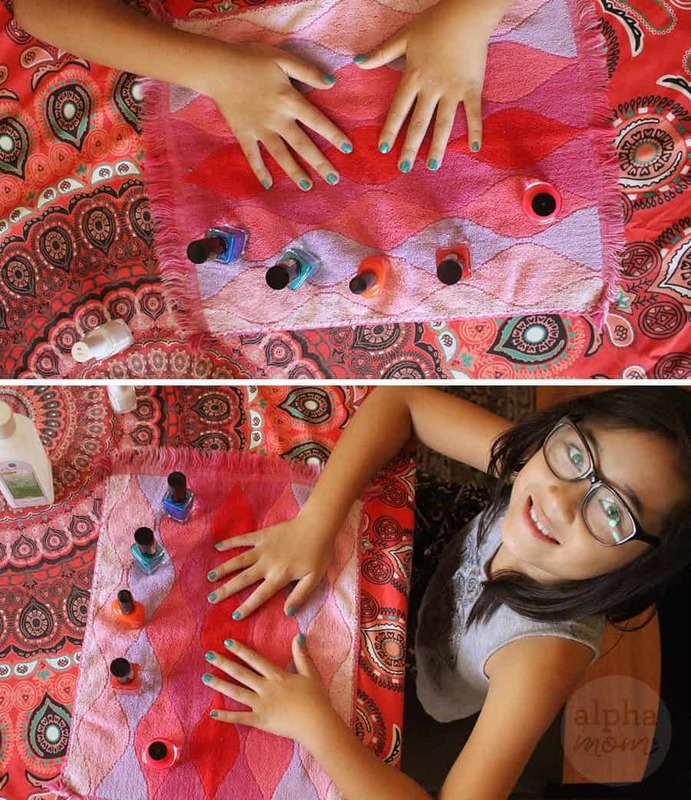 Sometimes simple touch like this can be so healing and many tween girls definitely could use some positive energy with the drama they may have to deal with school, as they maneuver through difficult social situations and crazy friendships. 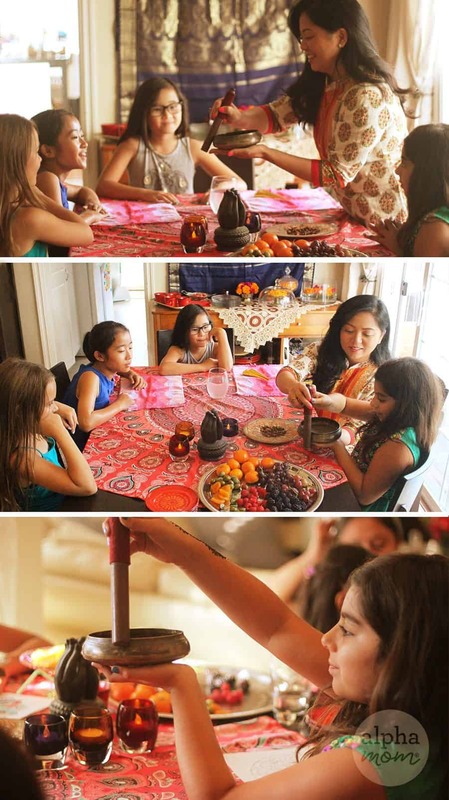 The next day we all got together for breakfast to show off and admire our cured henna! It turned out so pretty and is still lasting all week. Henna is applied as a thick paste and you need to leave it on for a few hours to let it “cure.” The best plan is to leave it on until right before you go to bed. Then, “flake off” the dried paste and then wash your hands without soap (soap removes skin cells that the henna is attached to). Dry your hands carefully and then apply lotion or coconut oil to keep the skin cells moist and preserve the henna the longest. We hope you enjoyed our festive Diwali party as much as we did!